Looking for a self-storage rental in Poway, CA? Big Box Storage provides convenient portable storage throughout Poway. Have a storage unit delivered straight to your home or business in zip code 92064, load at your pace, and it will then be picked up by one of the company’s friendly drivers and transported back to the secure, local storage facility in the Poway area. Access to your “Big Box” is available seven days per week at the storage center. The convenience of storage delivery and pickup (portable storage) is unmatched. There’s no need to rent a truck, no need to load a truck, and also no need to unload a truck. Normally each of these must take place before ever even getting the chance to load the storage unit. 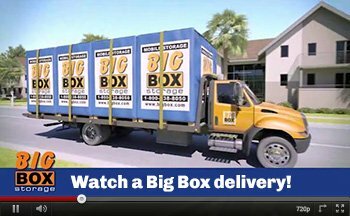 With Big Box Storage, the storage container is delivered right to your Poway address. Simply load the Big Box and you’re done. The company also provides storage in Escondido as well as storage in Miramar. The size of each Big Box unit is identical to one another. The dimensions measure eight feet by five feet by seven feet (length by width by height). On an average basis, they’ll each hold approximately 50 medium boxes (or about 1.5 rooms). Need more space? You can certainly have as many Big Boxes delivered as you need. Each one will easily fit inside of a single park space (one will fit anywhere a car might otherwise be parked). Regarding storage prices and rents, customers enjoy great rates that also come with a guarantee that they will be the lowest in Poway (as well as San Diego County). To view the current rates and promotions, please visit the rates page. Please feel free to contact Big Box Storage at 858-790-8580 if you should have any questions or comments about portable storage. Representatives can also assist with scheduling a delivery based on whatever day and time fits your schedule. Alternatively, you can also save $25 by scheduling a Big Box delivery online. Should you find a lower rate offered by a competitor within San Diego County, Big Box Storage will be pleased to not only match the lower rate, but also beat it by 10%. Details surrounding any lower rate (e.g. competitor name, price, applicable promotion code) must be provided at time of scheduling. 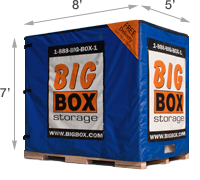 Big Box Storage is pleased to back its rental rates with a low price guarantee. Should you find a lower rate offered by a competitor within San Diego County, the company will be pleased to not only match the lower rate, but also beat it by 10%. Please note that the details surrounding any lower rate (e.g. competitor name, price, applicable promotion code) must be provided prior to the start date of the initial rental period.